Welcome to Two Y Ranch! Come take a look at our Chihuahua and Toy Aussie puppies! NEW ADDITIONS HERE AT TWO Y RANCH! WE HAVE TINY LONG AND SMOOTH COAT CHIHUAHUAS! WE NOW ARE BREEDING FRENCH BULLDOGS AND BOSTON TERRIERS! 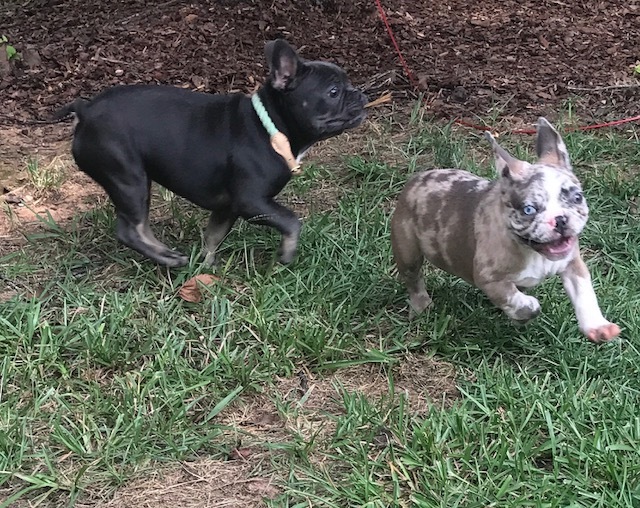 WE BREED A FEW COLORS INCLUDING BLUE WITH TAN POINTS AND MERLE FRENCH BULLDOGS! OUR BOSTONS ALSO COME IN A VARIETY OF COLORS INCLUDING LILAC, MERLE, AND BLUE. Visit our new YouTube channel to see videos of the puppies playing! Olga is a Micro female blue French Bulldog imported from Russia. She is very compact! Gemma is a merle female French Bulldog and is co-owned with Alyssa in South Dakota. Feel free to browse our site and contact us with any questions you may have. Please take a look at our contract prior to making a deposit, as once you do you will be bound by its terms. Click here to view a pdf of the contract. We breed smooth and long coat Chihuahuas in a variety of colors including; blue, chocolate, brindle, and merle! Our puppies have wonderful champion lines, import lines, or both! We breed both pet and show quality. Our Chihuahuas are registered with AKC. We now have added French Bulldogs and Boston Terriers to our breeding program. We no longer breed Toy Aussies and have down sized our Chis to allow for our new family members! We will be specializing in blue, merle, and lilac French Bulldogs and Bostons. Check out the about page for typical pricing on puppies. We also offer nationwide shipping.